The Stata Conference connects you with the best and the brightest of the Stata community, offering a variety of presentations from Stata users and StataCorp experts. 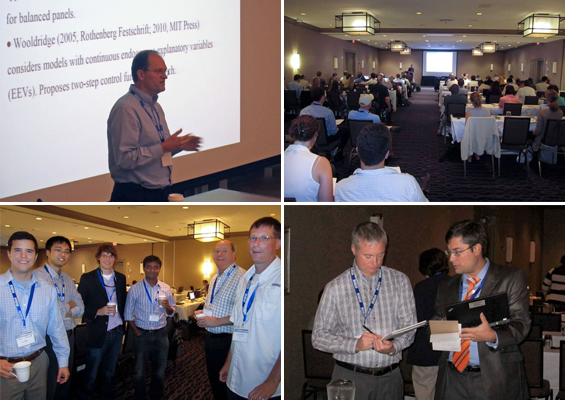 This year’s conference will be held July 30-31, 2015, in Columbus, Ohio, and is open to all Stata users wishing to attend. The 2011 Stata Conference will be held on July 14 and 15 at the University of Chicago’s Gleacher Center. I’ve enjoyed meeting many enthusiastic Stata users at previous Stata Conferences, and I’m looking forward to seeing both familiar and new faces this year in Chicago. The 2011 Mexican Stata Users Group meeting has been scheduled for May 12, 2011. The Mexican Stata Users Group meeting is a one-day international conference about the use of Stata in a wide breadth of fields and environments, mixing theory and practice. The bulk of the conference is made up of selected submitted presentations. Together with the keynote address and a featured presentation by a member of StataCorp’s technical staff, these sessions provide fertile ground for learning about statistics and Stata. All users are encouraged to submit abstracts for possible presentations. For the full meeting details, submission guidelines, and registration information, please see www.stata.com/meeting/mexico11/. Humanidades, Ciudad Universitaria, C.P.04510, México, D.F.